Through a whirlwind of brilliant adventures near and far, nearly half of this current year has gone. And that means that we now found ourselves arriving in summer, and a time when winter huddles seem a distant memory. One of my favourite things about the summer months is the basic pleasure that comes from being outside for a larger proportion of my time. Many of our most enjoyable past times get a breath of fresh air in the summertime; from a drink at the pub, our lunch break from work, exercise, and musical performances. This first of two posts dedicated to outdoor summer culture is all about that most classic form of outdoor entertainment – the open air theatre. There has recently been a variety of open air cinemas and theatres popping up across the UK, whether in large spaces like parks or tucked up on a city centre rooftop. One of the most acclaimed outdoor theatre companies can be found in London’s Regent’s Park. Trees form the walls, while above is kept completely clear. The risk of performances being cancelled due to rain is definitely there, but the ambience that comes from the gradually setting sun handing over control of the sky to the moon and stars as the performance progresses is more than worth this risk. This makes for a magical setting for any play, with the exterior setting making for a truly immersive experience. The opening production this season was J.M. Barrie’s Peter Pan, based on what is easily one of my favourite stories of fantasy. We all know the story well, and the Regent’s Park production presented the story in its classic form; though with some great twists to shake things up a bit. The story was here framed by a poignant World War One setting, starting in a field hospital on the Western Front where a nurse’s reading to a blinded patient sets us off on the adventure. Such a grim historical setting made it easy to see why Peter and The Lostboys would choose to remain in Neverland. The early twentieth century style was maintained with ingenious set, prop and costume design; from Tinkerbell styled around a lantern, to Captain Hook appearing as a metal armed military officer and the monstrous crocodile constructed from industrial lamps and a wooden trapdoor. The stage crew wore soldiers’ uniforms from the era, which created a beautiful clash of Neverland’s fantasy and the harsh reality of the war we started off in. 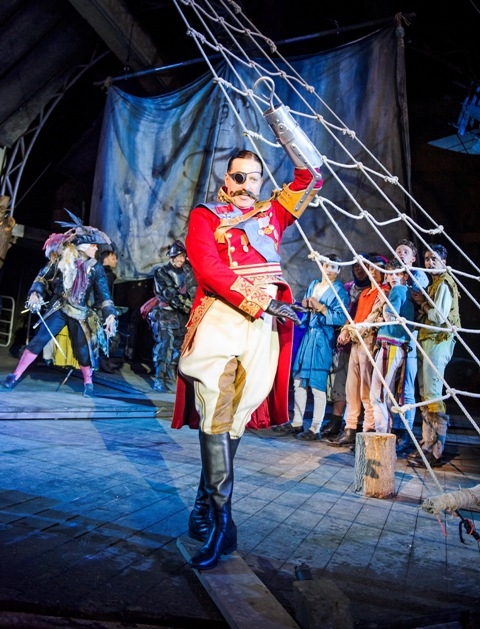 Obviously any Peter Pan production faces a significant physical challenge – how to make the characters fly. Flight was here achieved magnificently, with the WWI clad stage crew doing an incredibly job controlling the pulley systems. 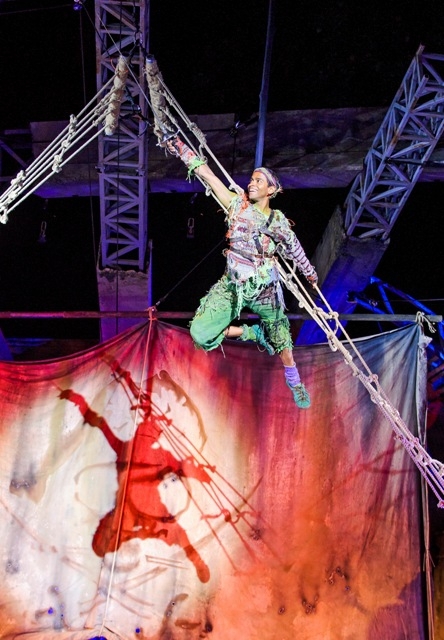 Peter Pan himself (played by the brilliant Hiran Abeysekera) effortlessly glided high and low, often in a spiralling motion that left the audience absolutely enchanted. While our outdoor season is slightly on the brief side, it seems that with help from entertainment like this we can really make the absolute most of it.